Progress! must it always abuse the land you see the square concrete boxes of change, the dotted skyline of ugly yellow cranes in vane upwardly they strain, the money game has no shame only the weak and the poor remain the same. Look! casting their shadows over the richness of the past then who’s to say how long this clash will last, this burden! the futures must outlast still food for the hungry remains just out of grasp. Oh here’s thy blessing before the arc of a naked sun dancing into a Cambodian sky from a stranger just passing bye No! I speak not as one representing a lack of sin we westerners our greed has no end, will dispatch aircraft carriers if we can’t win. Oh misty waters of the mighty Mekong Delta you have fed this land while providing it shelter fighting the death grip of progress that’s halter shelter, uplifting life-giving waters may this not be your final stand may death be not just around the bend, let no sorrow in tomorrow win. Enlightenment! 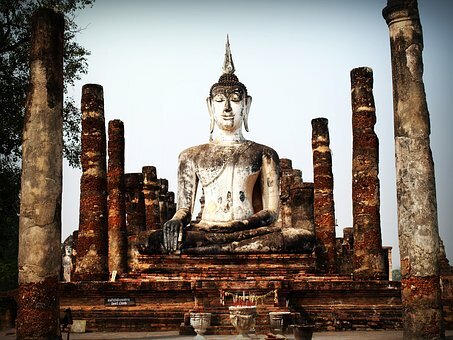 is a decision your ancient religion has such vision heed the discipline in Buddhism’s wisdom, evolving evolution need practical resolutions reaching a balance with the past Buddha’s smile on the Kingdom will never pass, long live the King in this noble task.